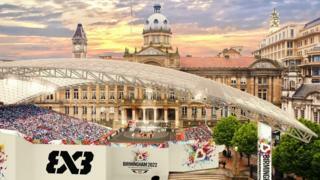 More than 2,000 dancers from Birmingham will be performing in the Commonwealth Games closing ceremony to welcome the event to the Midlands in 2022.In 15 minutes, performers hope to "tell the story of a city that is young, diverse and full of talent" to a TV audience of up to one billion people.The ceremony will be broadcast live on BBC Two from 11:00 BST on Sunday.Birmingham 2022 organisers said it would be "an opportunity to share this amazing city with the world". Accompanying the dancers will be a film made by Daniel Alexander from Oldbury and a performance from Erdington-based singer Lady Sanity. The singer, who will be performing to an audience of 40,000 at the Gold Coast's Carrara Stadium as well as TV audiences around the Commonwealth, said it was "a wonderful opportunity to showcase myself and showcase my city". What could Birmingham offer 2022 visitorsChief executive Gary Topp said the performance would "tell the story of a city that is young, that is diverse, it's full of talent, it's got energy and that's really looking forward to its future".